U.S. retail giant Walmart is looking to add more domestic workers to drive its fleet of trucks amid a nationwide shortage. The company announced on Wednesday that in addition to the 1,400 truck drivers the company added last year, it is hoping to hire “hundreds more” in 2019. 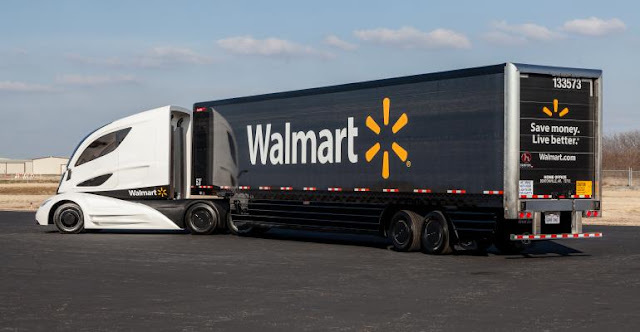 “We’re leaning heavily on the expertise of our Walmart road team and our certified driver trainers to grow our skilled fleet of professional drivers,” Lori Furnell, Walmart’s director of driver talent acquisition, said in a statement. In 2018, Walmart’s same-store sales hit 3 percent, it said, fueling the need for new employees. In order to entice more drivers to join its team, Walmart – like many other companies seeking qualified drivers – is raising pay. The company said that as of February, its drivers will earn one additional cent per mile, on top of additional pay for every arrival. The retailer says, on average, its drivers will make about 89 cents per mile – or $87,500 per year. Walmart’s ability to offer competitive pay and benefits could exacerbate a growing shortage of qualified drivers in the industry. While some drivers in the industry can earn in the $60,000 to $70,000 range, those with fewer qualifications or experience can earn less. In 2016, the industry was short more than 36,500 drivers, according to the American Trucking Associations, which expected that number to surpass 63,000 in 2018. By 2026, it could swell to 174,000. One reason Walmart could be making a push to attract drivers is that the shortage has raised freight prices, putting pressure on shipping costs and consumer prices. The Federal Reserve said over the summer that limited trucking capacity was leading to both rising prices and wages. The problem becomes even more exaggerated for companies like Walmart that offer free and expedited shipping options. By expanding its own fleet, the retailer may be looking to bypass some of those effects.